Give yourself and family a wonderful sleep with the Laveno 012 white Dresser and Mirror in this bedroom series. 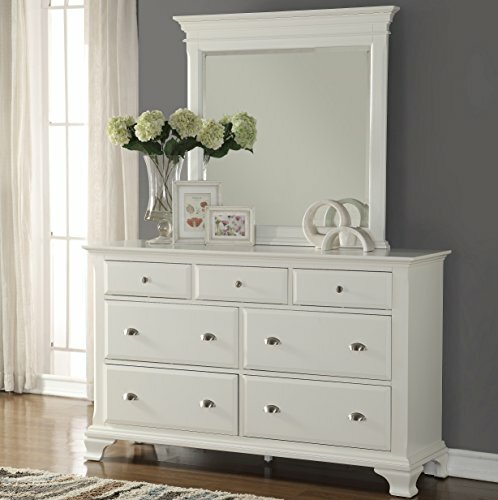 This dresser and mirror set is crafted from Solid Wood Construction that's finished with a smooth white. Seven full, molded-front drawers provide enough room for clothing and accessories. One or two cool nickel pulls on each drawer help complement the white exterior on this modern classic and make it easier and more convenient. S shape feet are designed to serve and support. The mirror features a coordinating white frame and a molded top. This classic design and bold style add a special feature in your bedroom. A molded top mirror on white wood frame, dimension:43 X 3 X 40H"